The Smithsonian’s connection to flight dates from its earliest years. 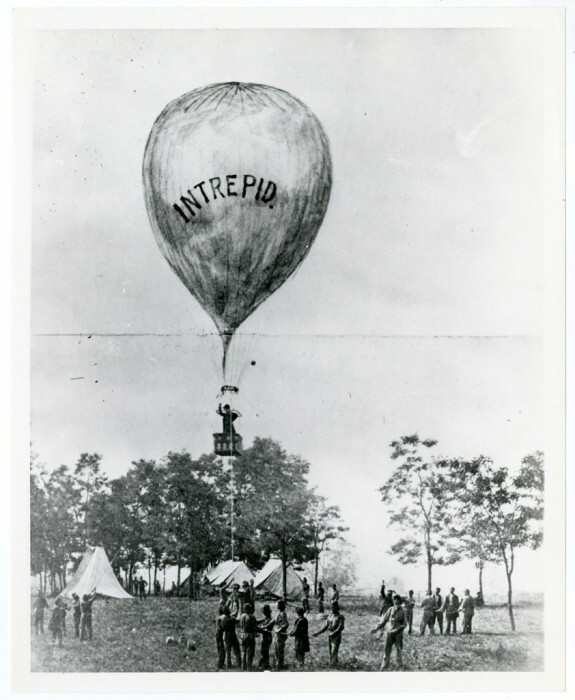 The display of a hot air balloon designed for military use by Thaddeus S.C. Lowe, for example, occurred in 1861 outside the Institution’s original building, the “Castle.” Joseph Henry, a physicist and balloon enthusiast who served as first Secretary of the Smithsonian, invited Lowe to demonstrate his aircraft, which led to the birth of aerial reconnaissance during the Civil War. The Institution’s third Secretary, Thomas P. Langley, also a physicist as well as an astronomer and inventor, worked to create the world’s first powered, human-carrying aircraft during his tenure. His Aerodrome A failed for the second time after it was launched from a houseboat on the Potomac just nine days shy of Dec. 17, 1903, the day Orville and Wilbur Wright made history at Kitty Hawk. Interestingly, the Smithsonian’s aeronautical reputation was such that the Wright brothers had written to the Institution in 1899 to request information on flight. Their letter is now exhibited near the original Wright Flyer, one the most famous artifacts in the Institution’s collection. Secretary Langley’s Aerodrome A is also preserved the collection, along with hundreds of aircraft, spacecraft and related artifacts. The flight collection itself began with 20 Chinese kites that had been displayed at the 1876 American Centennial Exposition. Given to the Institution in 1882 by the Chinese Imperial Commission, the kites seeded what would later become the largest collection of aviation and space artifacts in the world. In the early 20th century, progress in human-powered flight was so swift that, by the end of World War I, Charles Walcott, fourth Secretary, directed that significant aircraft be collected by the Institution. To oversee the growing collection, a Section of Aeronautics in the Division of Engineering was established at the Smithsonian. Paul E. Garber, assistant curator, began a systematic effort to collect the most important examples of aircraft, a strategy that would lead to a national collection distinguished by many “firsts,” one-of-a-kind, and historically significant artifacts. By the end of WWI, the aeronautical collection exceeded the Institution’s capacity to house and display it. From its initial home in the Arts and Industries Building adjacent to the Smithsonian Castle, the collection expanded to a hut erected by the War Department behind the Castle. Known as the “Tin Shed,” the new building opened to the public in 1920 and would remain in use for the next 55 years. Creating a national air museum as a separate bureau of the Smithsonian was enthusiastically supported by General of the Army H.H. “Hap” Arnold. Having had the foresight to preserve one of every type of Army aircraft as well as captured foreign aircraft, Arnold urged the Navy and commercial organizations to do the same. He then worked with Congressman Jennings Randolph to promote the concept and Aug. 12, 1946, President Harry Truman signed Public Law 722, establishing the Smithsonian’s National Air Museum “to memorialize the development of aviation; collect, preserve, and display aeronautical equipment; and provide educational material for the study of aviation.” For the next two decades, as a Washington site for the future museum was sought and funding debated, the problem of storing the burgeoning collection intensified. Garber identified land in Silver Hill, Md., where several prefabricated buildings were erected to house artifacts. It would be two decades be before funding for a museum building was approved. In the meantime, progress in aerospace technology was about to propel America beyond Earth’s atmosphere and into space. Decades before spaceflight became a reality, the Smithsonian took a leading role in funding one of America’s most important rocket pioneers. In 1916, Robert Goddard wrote to Charles Greeley Abbot, the fifth Secretary, requesting a grant to support his research. The Smithsonian awarded him $5,000 to conduct his more elaborate experiments in rocketry and eventually published his classic treatise, A Method of Reaching Extreme Altitudes. Funding to construct a building was approved in 1971 and the location would be on the National Mall between Fourth and Seventh streets S.W. The Smithsonian’s eighth Secretary, C. Dillon Ripley, hired Apollo 11 astronaut Michael Collins to direct the National Air and Space Museum building project. Collins would guide the museum through its construction, hire a team of professionals, oversee the creation of exhibits and launch the museum’s Center for Earth and Planetary Studies. 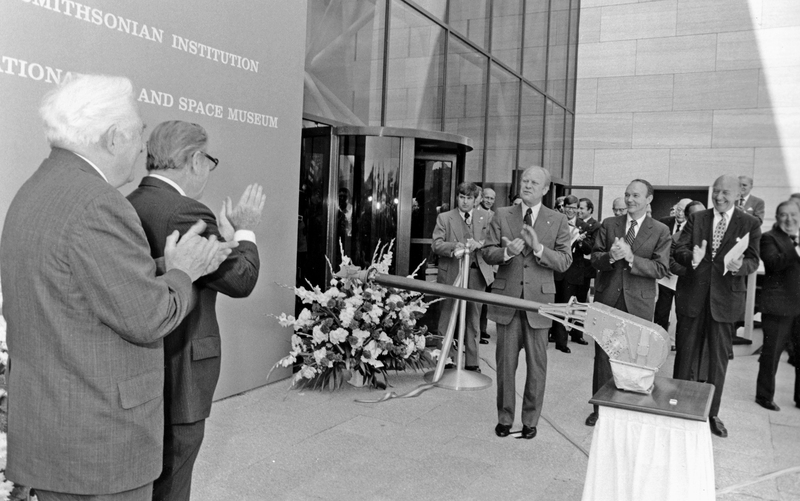 Groundbreaking took place Nov. 20, 1972, and in early 1975, installation of air- and spacecraft began. The goal of opening during America’s bicentennial year was met, and the building was inaugurated July 1, 1976. The success of the Smithsonian’s new National Air and Space Museum exceeded expectations. The millionth visitor crossed the threshold just 25 days after its opening; the five millionth visitor just five months later. Today, the National Air and Space Museum is one of the most visited museums in the world and, in most years since it opened, including 2015, the most visited museum in America. Two days before the 100th anniversary of the Wright brothers’ historic 1903 flights, the museum greeted the second century of flight by opening a second, larger building, the Steven F. Udvar-Hazy Center. In 1993, President Bill Clinton signed Public Law 103-57 establishing an extension for the museum at Washington Dulles International Airport and, three years later, signed Public Law 104-222, authorizing the museum to construct the facility using privately raised funds. Named for the donor who gave $66 million for its construction, the Udvar-Hazy Center houses many of the museum’s largest artifacts. In addition to the aircraft and related objects in its Boeing Aviation Hangar, the Center houses rockets, missiles, satellites, spacecraft and other artifacts in its James S. McDonnell Space Hangar. In 2011, a new wing of the complex opened, consisting of the Mary Baker Engen Restoration Hangar, the Emil Buehler Conservation Laboratory, archives and collections processing and storage facilities. The collection that started in 1876 with a group of 20 kites has grown to nearly 60,000 objects. A large portion of the major objects in the collection are on public display, either at the museum or on loan to other Institutions around the world. Many more objects remain in storage. The museum remains the preeminent American institution for commemorating flight while collecting, preserving and presenting the history, science and technology of aviation and space exploration. The museum is preeminent in the research of the history of aerospace science, technology and culture and also plays a pivotal role in planetary research through its Center for Earth and Planetary Studies. The museum’s current director is General J.R. “Jack” Dailey (USMC Ret.) who assumed his position in January 2000. 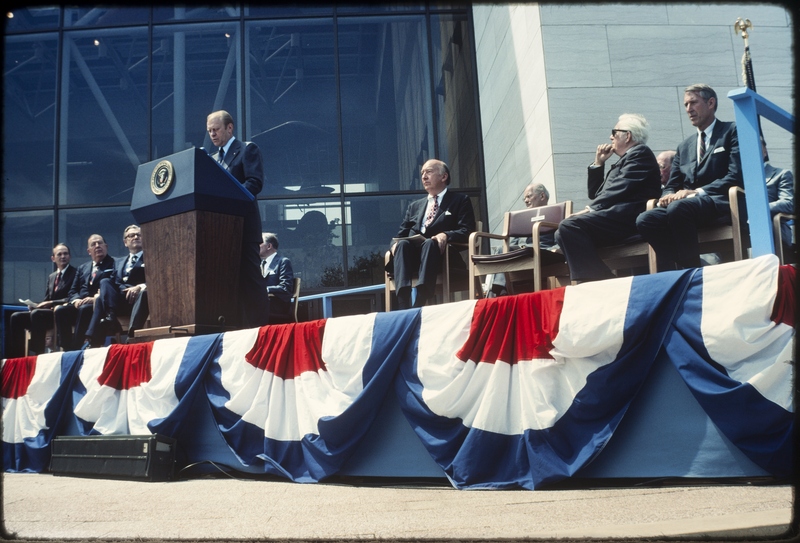 President Gerald Ford gives remarks at the opening ceremony of the National Air and Space Museum's building on the National Mall, July 1, 1976.